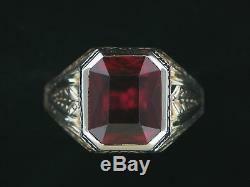 Yellow and White Gold Vintage Man's Ring with a Synthetic Ruby. This handsomely hand engraved Estate Mans' ring is set with a cushion shape synthetic ruby, 12x10mm. In a white gold bezel. 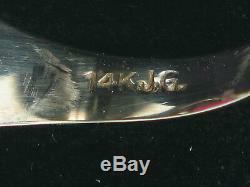 The ring and engraving are in incredible condition for its' age. This is an old world treasure! Yellow and White Gold Ring with a Synthetic Ruby. Yellow and White Gold with a Synthetic Ruby. Total weight :9.2 grams. We have been one of the Philadelphia areas most reputable jewelers since 1974. We guarantee that all items we sell are properly appraised and detailed information on the piece is listed. If you feel that there is a discrepancy, please notify us. One of the Philadelphia areas most trusted jewelers since 1974. We not only specialize in jewelry sales, but also custom design, repairs, appraisals and estate. 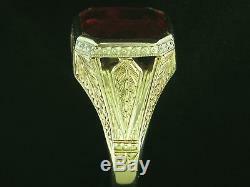 Yellow and White Gold Vintage Mans' Ring with a Synthetic Ruby" is in sale since Thursday, August 2, 2018. This item is in the category "Jewelry & Watches\Fine Jewelry\Fine Rings\Gemstone". The seller is "djjeweler" and is located in Warrington, Pennsylvania. This item can be shipped to North, South, or Latin America, all countries in Europe, all countries in continental Asia, Australia, New Zealand, Egypt, Reunion.